Liftow offers courses that have been accredited by the Canadian Supply Chain Sector Council’s national standard. 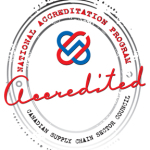 The National Accreditation Program (NAP) recognizes supply chain-related educational offerings that meet the Canadian Supply Chain Sector Council’s national standard. The NAP standard reflects industry’s needs and educator’s best practices. Thanks to those of you who voted us as the Reader’s Choice Award for the best Forklift Safety Training Provider. 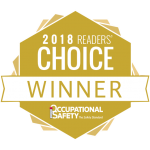 This award identifies companies that are the best at what they do and are the result from industry readers of Canadian Occupational Safety and cos-mag.com. We are honoured by this recognition. Not all safety training programs are alike so don’t compromise! When you see the “Liftow Certified” seal of excellence you can rest assure that our graduates have been trained and certified by the industry leader in forklift and industrial safety training. Liftow is committed in creating a safer workplace by continually setting and exceeding the standard in forklift and safety training. Forklift Certification, Aerial Work Platform (AWP), Scissor Lift, Overhead Crane, Skid Steer, Front End Loader, WHMIS and more. View our monthly course safety training schedule at all our Training Centres. Call us today to receive more information on our industrial training programs.